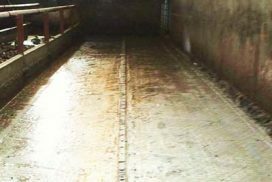 The Mayo Alley Mat is a tough flooring designed to keep cows off concrete. They are roughly 24mm deep x 1.8m x 1.22m & come with a checker plate surface and smooth underside. Mayo Alley Mats have a relatively smooth surface and are made to have a certain amount of give in them. This means that they are easy to clean using a tractor or automatic scraper without losing traction for the animals walking on them. 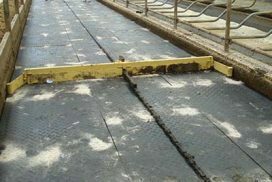 Individual mats are fastened in place using heavy duty thunder bolts which are countersunk into the surface. It is recommended that Mayo Alley mats be fitted by an expert. Q: Will it help reduce lameness? 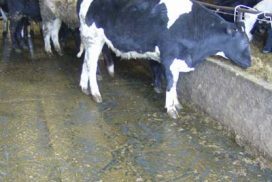 A: Evidence shows that a soft floor has enormous benefits in respect to certain types of lameness such as ulcers and white line injuries. Q: I’ve heard that the hooves will grow much faster on rubber floors? Should I leave some areas bare? A: Again, evidence shows that this is not the case. 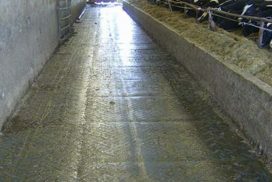 However, as the most benefit will be derived from matting the places in which the cows stand the longest, we generally advise to leave less important areas bare for economic reasons as much as any.